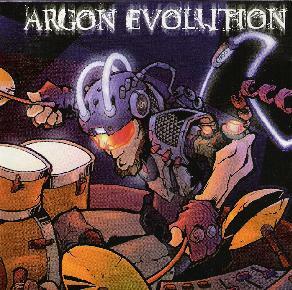 Argon Evolution, a project based around the considerable percussive skills of Scott Morgan, is a curious mixture of Photek-styled Drum 'n' Bass electronica and the Jamie Muir-driven King Crimson of Larks' Tongues in Aspic, minus Fripp's guitar wizardry. Morgan's acoustic kit is clearly the focus on Human, though various other tuned percussive devices, drum machines, samples, loops, and synthesizers form both the melodic and harmonic structure of each piece. Morgan also uses a variety of processors-phasers, pitch shifters, spectrum analyzers, distortion boxes, and vocoder, just to name a few-to not only modify but wholly transmutate many of the instruments he employs on Human. "Over Phase Modulation," "Whistler," and "Spring" are all impressive compositions that maximize the potential of integrating both acoustic and electronic drum kits, though it's apparent that much thought and strategic planning went into the composition of each piece on Human. In particular, the ingenious processing techniques-some of which Morgan describes in the liner notes-shows a complexity of structural experimentation that's often lacking in contemporary electronica. Fortunately, samples and loops are kept to a minimum. For drummers and percussion freaks, Human will be a rewarding listening experience, but Morgan's insistent experimentalist approach to sound construction may also appeal to improvisers and tone architects as well. Cybertribal drumming for the new degeneration. For more information you can visit the Argon Evolution web site at: http://www.argon-evolution.com.